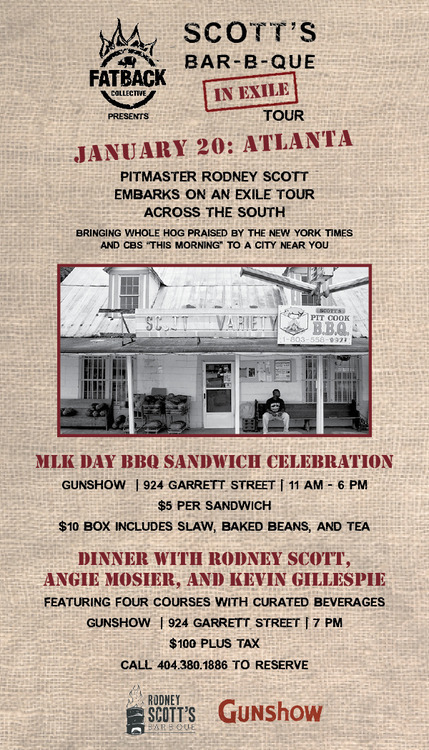 After the smokehouse at Scott’s Bar-b-que in Hemingway, SC, burned down last November, members of the Fatback Collective brought some of its members together to put on the “Rodney Scott in Exile Tour”, bringing Rodney Scott and his whole hog barbecue to towns around the South. The Atlanta stop was on Monday, at Gunshow, where they served Scott’s Bar-b-que sandwiches and plates from 11-6 and had a full fledged dinner with Scott, Kevin Gillespie and pastry chef Angie Mosier on Monday night. As I was heading out of town Monday afternoon, I swung by for lunch on the way to the airport. When I arrived, a little before 1:00, as soon as I stepped out of the car I smelled barbecue. I love the smell of barbecue in the morning – it smells like victory! For a great article on the preparation of the pigs, check out Brad Kaplan’s post at Creative Loafing’s Omnivore column here. Walking in the door, they had a line to the right greeting you with the question, “sandwich or plate?” I loved Bill Addison’s response to the question, on Twitter, “yes, please”. The sides were from Jim ‘n Nick’s, as were the paper goods. Jim and Nick came in on the ground floor of the rebuilding effort – I remember an article from early December where Nick, along with another BBQ owner, were at Scott’s, getting temporary burn barrels ready to keep them hogs cooking. 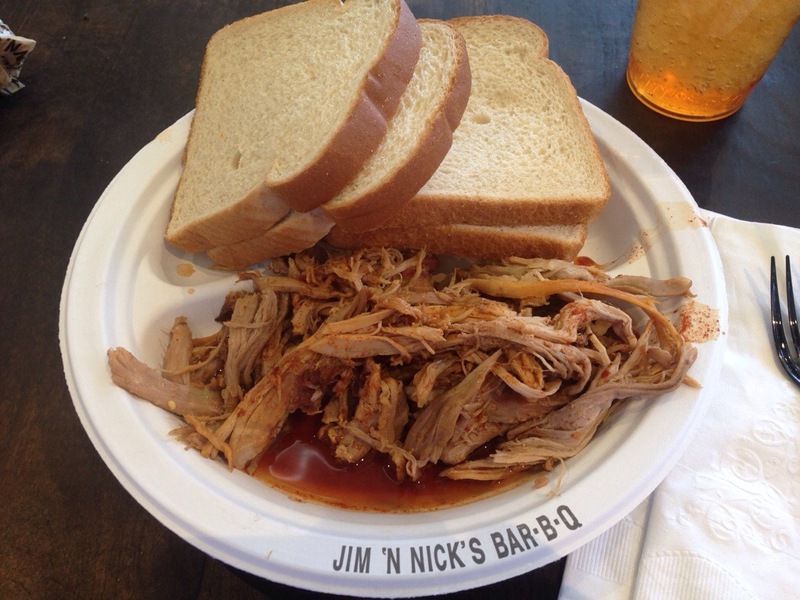 As I could get these sides pretty much any day, I opted for two sandwiches, as opposed to the plate, getting a giant lump of barbecue in the large section of my three section plate, and four slices of white bread. The sauce on this pork was thin and vinegary, filled with flakes of pepper, and glorious. I actually made four half-sandwiches, laying pork on half of a slice of bread, folding it and dipping it through the sauce. I cleaned that plate. To the left of the door walking in, I saw a 4′ x 6′ (I’m guessing dimensions) metal tray containing the pig from which they were pulling pork. 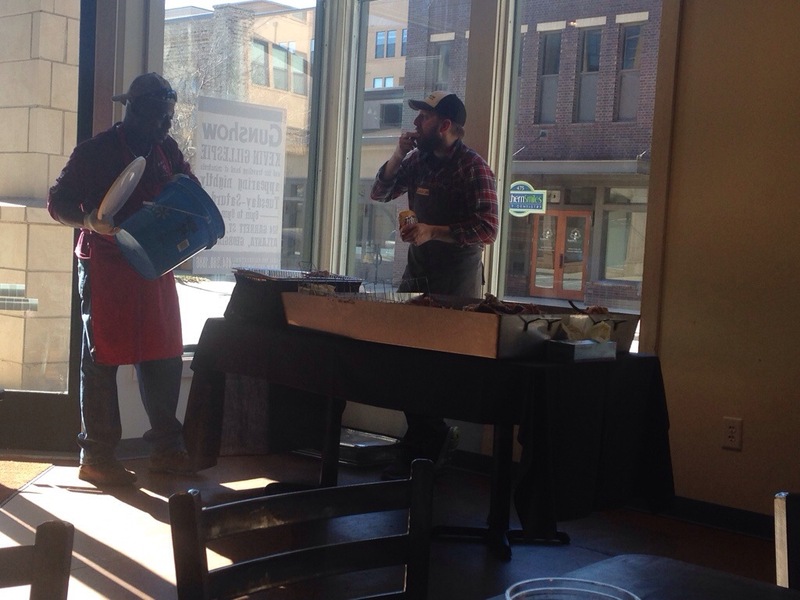 And as I was eating, I saw Rodney Scott pouring sauce on the freshly pulled pork from the giant metal tray where they were working. Pretty cool to watch. Looking around, the guys sitting next to me were friends of the pastry chefs husband. I preached the glory of Gunshow to them and told the story behind the rebuilding of Scott’s. The ladies to my left were from the neighborhood. 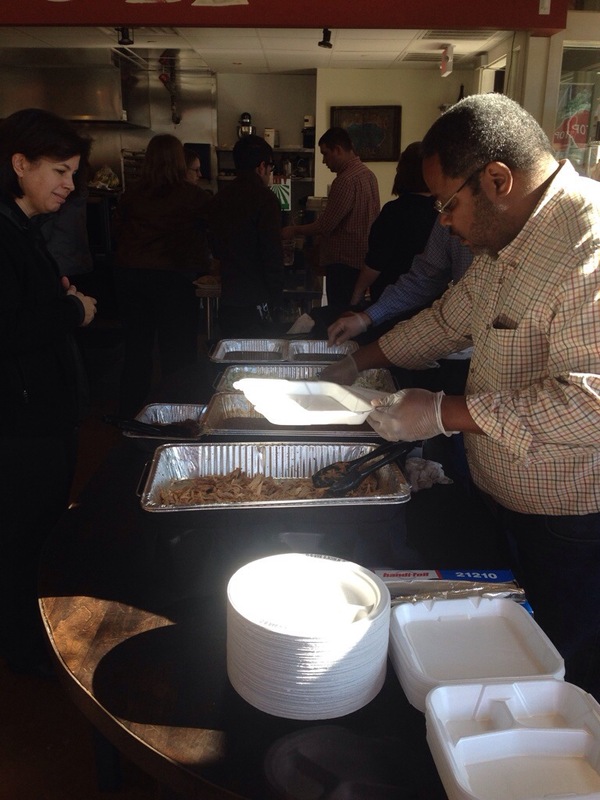 I was there because I had read about the benefit (and I LOVE barbecue). I kept seeing tweets throughout the day reminding people to go. And the support was strong. All kinds of people, one kind of food.